In the last couple of years, a composting partnership has formed between UNI’s Department of Residence and Facilities Services with one simple goal: reduce the amount of food waste at the University of Northern Iowa dining facilities. Composting has long been a viable technique for recycling and reusing organic waste, but its opponents often argue that it requires too much time and infrastructure to be cost-effective. The University of Northern Iowa is challenging that belief, however, with a relatively new composting initiative that is aimed at putting organic waste from its food centers to good use. A partnership between UNI’s Facilities Services and the Department of Residence (DOR), the program itself is actually quite simple in nature: food waste from the dining centers and the Maucker Union is collected by Facilities Services and subsequently composted on campus. 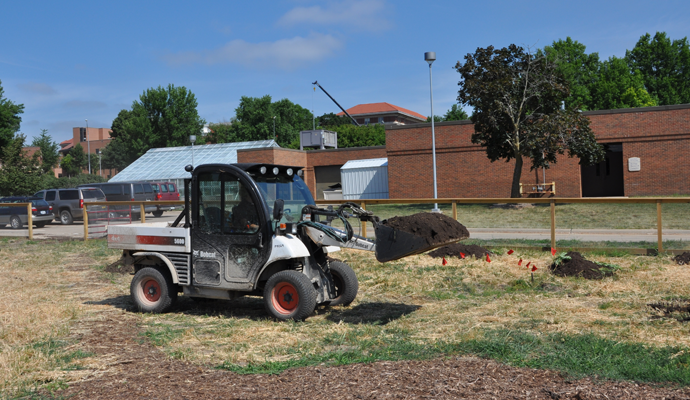 The compost is then used by the UNI grounds crews as fertilizer and soil supplement at multiple locations across campus. Overall, it’s a win-win situation for all the parties involved; the DOR has much of its food waste removed for free, cutting down on much of its waste production, and Facilities Services gains valuable fertilization material at almost no charge. Waste is picked up from the dining centers three times weekly, on Monday, Wednesday, and Friday mornings. The DOR’s waste mostly consists of fruit and vegetable peels, skins, and buds from oranges, pineapples, watermelon, corn, and a varied assortment of other produce byproducts. In addition to this food waste from the DOR, a large amount of coffee grounds from Chats in Maucker Union is also added to the compost pile. Facilities Services composts this food waste, and the resulting material is used as fertilizer and soil supplement for the Panther Plot student garden and for approximately fourteen acres of campus designated for natural, non-chemical turf management. So what makes UNI’s program unique? Other universities may have composting programs, but few take this completely “in-house” approach. In fact, with the addition of UNI’s Panther Plot, UNI’s composting system amounts to something of a closed cycle. Organic waste from the dining centers is composted on campus, and that compost is in turn used to fertilize UNI’s student vegetable garden, the Panther Plot. Produce grown in this garden is then featured in the UNI dining centers, and the cycle continues. For now, UNI’s composting program is relatively small in scale, especially when compared with other state university composting programs. Part of this is simply because UNI produces less food waste in the first place, but there certainly are areas for expansion. For example, all the current food waste that is composted from the dining centers on campus is pre-consumer waste, produced during the preparation of the food. If the dining centers really wanted to increase the amount of the material they’re composting, they could also look into composting post-consumer waste (i.e. leftovers). However, this requires considerably more time and logistics to make work. One issue that the dining centers face is storage. There may be ways to increase the amount of material be composted, but that is irrelevant if the material cannot be stored for pick-up.